Riyadh,19 Dec.,2018 – Burj Rafal Hotel Kempinski is proud to announce the appointment of Chef Fahad Abdullah Saleh Bukhari as Executive Chef. Fahad Bukhari comes with 17 years of experience having worked as Head Chef at Saudi Arabian Airlines, Executive Chef at Palace of the Queens - Jeddah, and later became Banquet Chef at Jeddah Hilton Hotel. 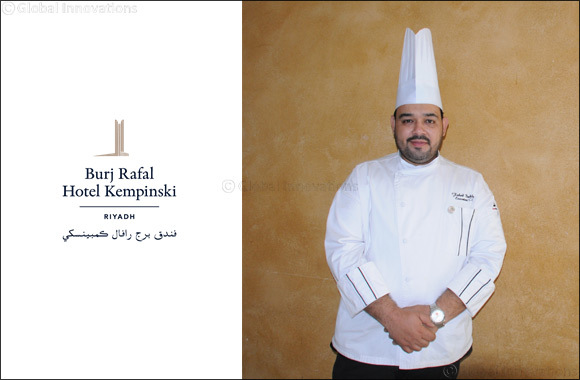 He also held the position of Chef de Cuisine for the Western Kitchen at HRH Prince Al Waleed bin Talal’s palace. For presenting the Saudi cuisine in its authenticity Chef Fahad has won several medals and awards in national and international competitions, among them the award for “Best Hygiene and Food Safety” by Saudi Airlines Catering as well as three years in a row the award at “Top Chef” for his food exhibitions. Furthermore he was a member of the jury in “Arabian Top Chef” (Season 2). Fahad Bukhari holds a diploma in catering from Saudi Arabian Airlines, as well as a bachelor’s degree in accounts from King Abdulaziz University.